When I wrote this story, I wasn’t thinking. At all. I was in the middle of feeling crushed, overwhelmed, and lost. But the community that has come together around Benny and his story has been nothing short of inspiring. 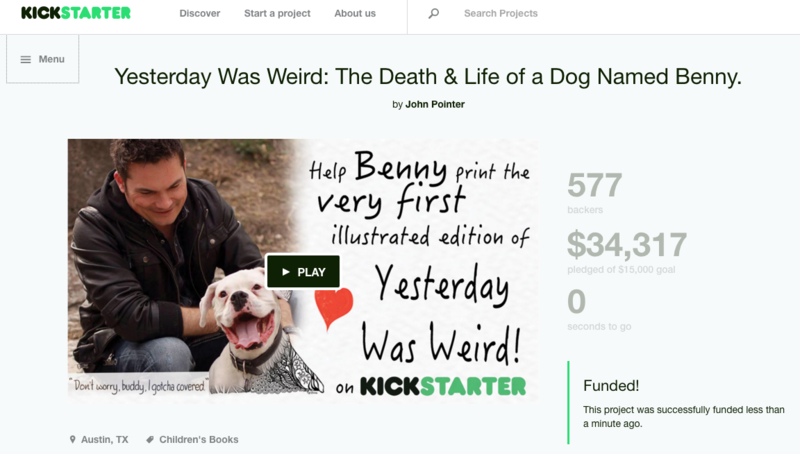 I launched the Kickstarter to fund the first edition of an illustrated, printed storybook on April 28th, 2016 at 9:30am, exactly three months to the hour after Benny’s body left us. It reached the minimum funding goal of $15,000 in just over 13 hours. Here, I want to specifically acknowledge Spike Gillespie, author and awesome person extraordinaire, for helping me get to the starting line. Without her calming presence and good advice, I couldn’t have organized the campaign anywhere near as well as I was able to. And now that the campaign has closed, I want to recognize all of you, the people who came together to back the project. I could never have seen this coming, and I am indescribably grateful. So without further ado, here is Benny’s Better Angels Brigade, in alphabetical order!